Whenever you turn on your faucet, do the laundry, or flush the toilet, the water flows from the pipes in your house into the main sanitary sewer line and eventually comes to us at the wastewater treatment center. It’s easy to forget about what goes down your drains, but what you flush does matter! We all have a responsibility to be good sewer stewards. Below we’ve provided some dos and don’ts that can help you keep the sewer system flowing smoothly and protect the environment. If it’s not one of these, it doesn’t belong in the sewer! DON’T wash fats, oils, or grease down the drain. They harden in sewer pipes and can cause clogs. DO place liquid fats, oils, and grease (FOGs) into a jar or container with a lid and then dispose in the trash. You can bring your used cooking oil to our Administration Center – learn more about our recycling program. Wipe down greasy pots and pans with a paper towel prior to washing in the sink or dishwasher. DON’T flush so-called “flushable” wipes. They do not breakdown in the sewer system and can cause blockages in pipes and our treatment center. DON’T flush kitty litter down the drain. It settles in pipes and can cause blockages. DO place a wastebasket in the bathroom to dispose of personal hygiene products such as wipes, disposable diapers, cotton swabs, dental floss, or feminine hygiene products. These items do not belong in the sewer system. DON’T dig or do extensive landscaping or excavating without calling JULIE (811) beforehand. DON’T plant trees over sewer pipelines. Roots can cause major damages and clog pipes. DO have your sewer rodded on a regular basis to remove root growth. This helps to keep roots under control and reduces the likelihood of sewer backup. DON’T connect roof, storm water sump pumps, or surface water drains to the sanitary sewer system. The extra water from these sources can overload the sanitary sewer system and wastewater treatment plant. DO call us anytime you are experiencing sewer back up problems. DON’T pour paint, engine oil, pesticides, or chemicals down the sink. Some of these hazardous materials can corrode the sewer, while others complicate the treatment process. These chemicals are a hazard to the environment and to maintenance crews working in the sewers. Use this Household Waste Chart to discover how to properly dispose of them. DON’T dispose of medicines or drugs in the sewer system. Our treatment plant is not designed to treat these chemicals which means they can end up back in the water supply. Check out our list of external resources for where to properly dispose of them. The District recently began partnering with SCARCE, a local environmental non-profit organization, to be a permanent collection site for their cooking oil recycling program. Our customers and residents in the surrounding area are encouraged to recycle their used cooking oil instead of pouring it down the drain or disposing of it in the garbage. When you pour fats, oils, and grease (FOGs) down the drain, they harden in your pipes or sewer lines and can cause a sewer backup either in your home or neighborhood. FOGs come from meats, butter, cooking oil, lard, sauces, dressings, and dairy products. Even if hot water is running when it goes down the drain, cooking oils and fats solidify as soon as they reach cold pipes. Help us keep cooking oil and grease out of our sewer system! After cooking, collect your used cooking oil into a container. 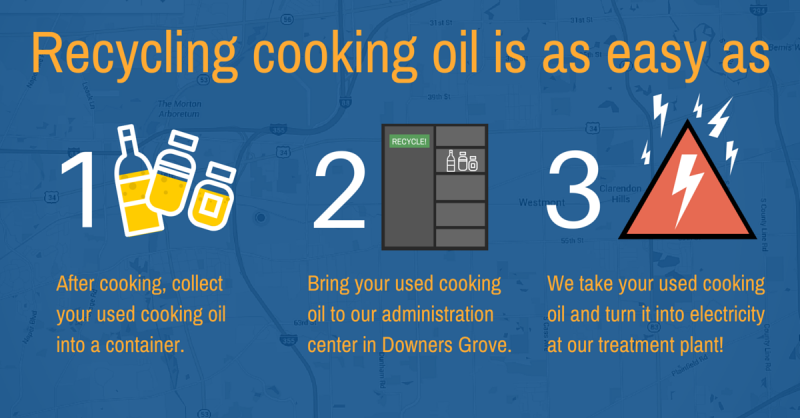 Bring your used cooking oil in a sealed container to our Administration Center in Downers Grove. We take your grease and turn it into electricity at our treatment plant. Now that’s recycling at its best! Cooking oil can be dropped off in a sealed container at the Administration Center at 2710 Curtiss Street, Downers Grove at any time. Please note, this program does not include the recycling of motor oil. The Village of Downers Grove collects motor oil at their Fleet Services garage, Monday through Friday from 7 a.m. to 3 p.m.